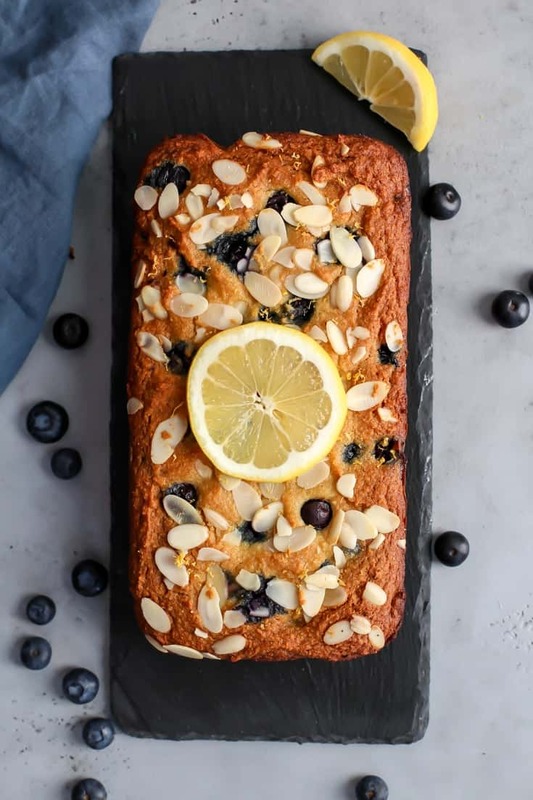 This Paleo Almond Lemon Blueberry Bread needs to happen STAT. A simple recipe mixed by hand and ready within the hour. 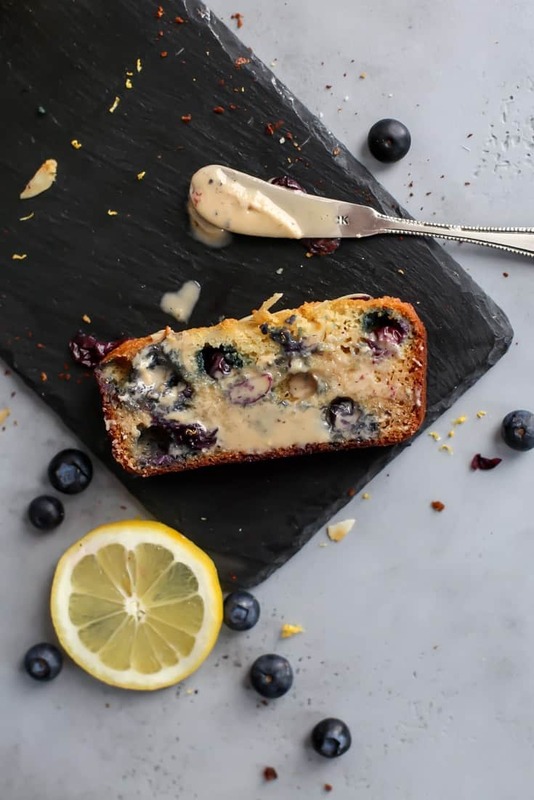 Bursting with blueberries and lemon flavors, this grain-free bread is a must. This post is sponsored in partnership with Bob’s Red Mill. As always, all opinions expressed are my own. 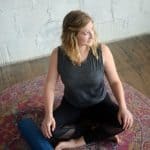 Thank you for supporting Fit Mitten Kitchen! Happppy Friday, peeps! Gearing up for a weekend spent with friends up north. Yes, us Michiganders still venture north even in the winter time. We’re renting a house on a lake – all the husbands will ice fish while the girls A) stay in the warmth drinking hot chocolate, play games and B) travel into Traverse City to walk around and find other things to do that don’t have to do with sitting outside on ice. 😀 I’ve heard the ice shanties get pretty warm but I’d just rather not. I’m a summer girl through and through. Thankfully the temperatures are supposed to get above freezing, so when we do venture out into town we won’t be in the frigid cold. It’s only the middle of January but man can winters in the Midwest feel especially long… Drew and I are officially planning a trip to Hawaii and I am super excited. It won’t happen until March but I am sure it will be here before we know it. Drew and I never took a real honeymoon and it’s been almost three years since we’ve been married. I suppose at this point it’s just a vacation. But still! It’s a vacation we’ve been talking about for over a year and finally making it happen is a dream come true. This recipe first started out as banana bread but then I started craving lemon-flavored goods so I altered the recipe a bit. So to all you banana haters, you’re welcome. Banana lovers, you will have to wait for another time. I digress… So once I changed the recipe it took me another two tries to get the texture I was anticipating. But I am happy with the results so here we are! Plus, who doesn’t love the lemon blueberry combo?! It’s one of the best matches there is. And it kind of reminds me of summertime which I am all about. 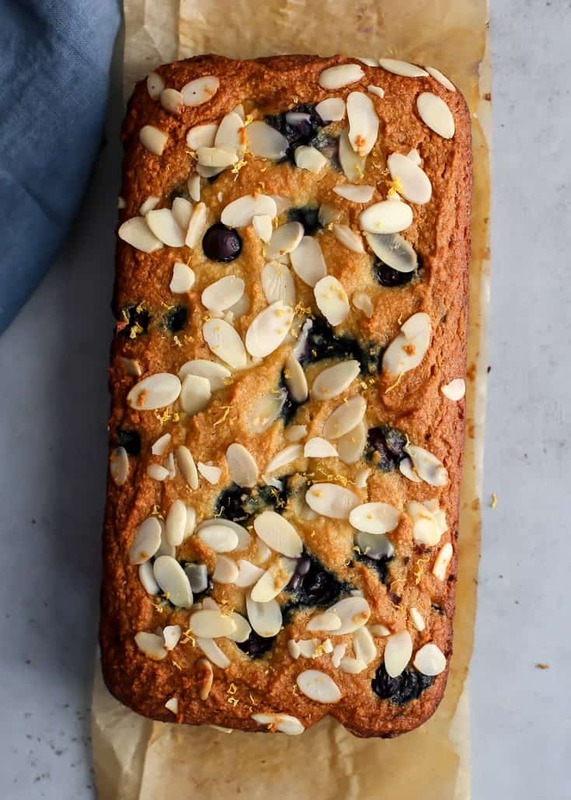 The main ingredient we’ll be using in this Paleo Almond Lemon Blueberry Bread is the blanched almond flour from Bob’s Red Mill. Note that we’re using the blanched almond flour, NOT “natural almond flour” also known as almond meal. 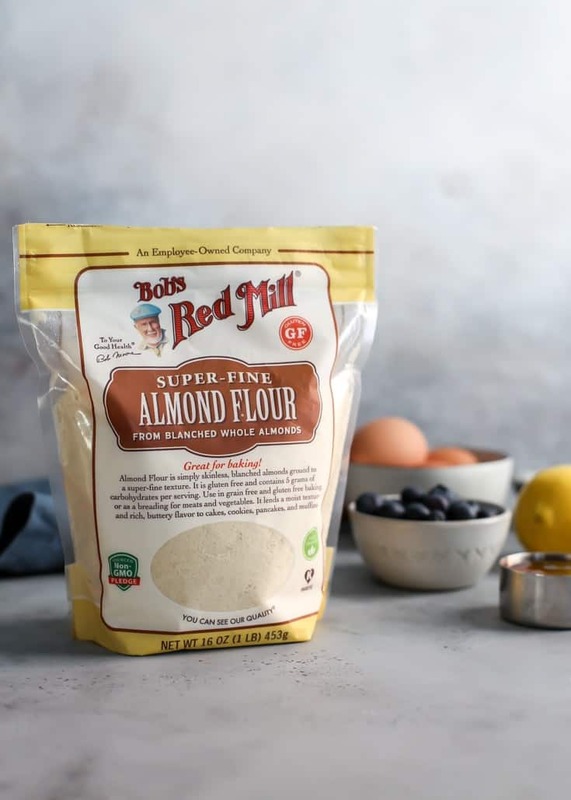 I’m super excited to be partnering with Bob’s Red Mill this year – their quality ingredients are pantry staples in the FMK household, and I am sure many of yours too! This recipe is really quite simple and comes together in a few simple steps. You’re mainly mixing the dry ingredients together separately from the wet, then combining them before folding in the blueberries. Flours – As noted above, the other dry ingredient needed is tapioca flour. 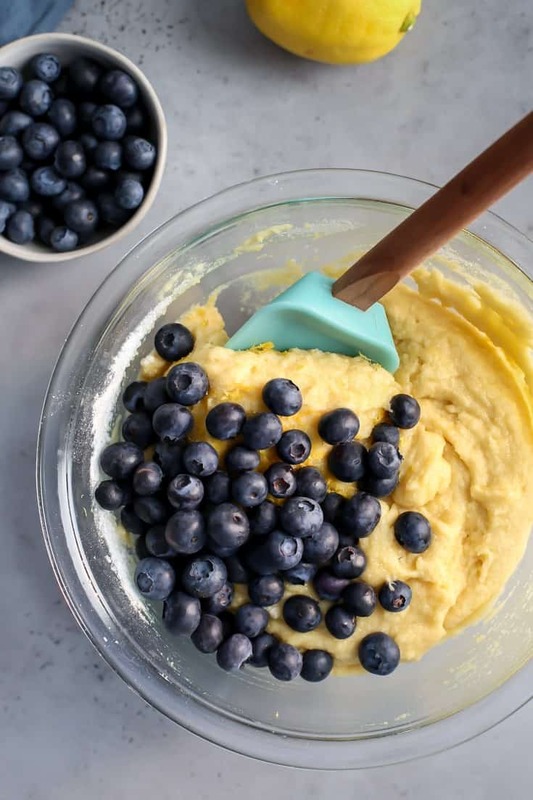 If you’re not familiar with grain-free baking or baking with almond flour, the tapioca flour helps bind the ingredients together a bit better than leaving it out of the recipe. I did not test this recipe with wheat flours or other gluten-free flours, so I wouldn’t recommend subs here. If you don’t bake with tapioca flour often, try shopping the bulk bins at your grocery stores. Oil – I tested this recipe with both ghee and macadamia nut oil, but any oil should be fine. Sweetener – I used honey here but you can *likely* sub another liquid sweetener with similar results, though I did not test that myself. I would not recommend a dry sweetener here as it will throw off the liquid ratio a bit. Baking – To prevent the top from browning too much, add piece of foil over top of loaf pan halfway through baking time. And that is pretty much it my friends! 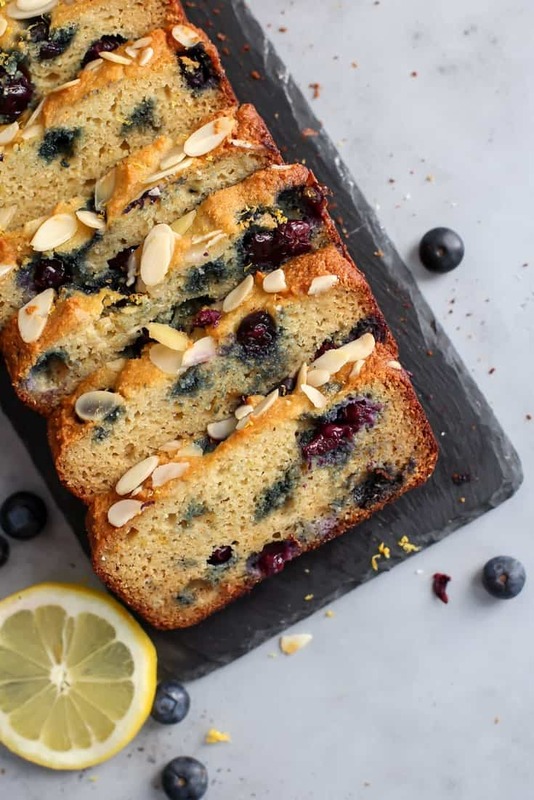 After about 40 minutes of baking you have yourself one luscious loaf of lemon blueberry bread to dive right into. Moist, soft and almost cake-like in texture. I seriously couldn’t stop eating it and I think I’ll be making another loaf here ASAP. This very well may be one of my best grain-free paleo breads yet! In medium bowl add almond flour, tapioca flour, baking soda, salt and zest from 1 lemon; set aside. In large bowl whisk together eggs, oil, honey, lemon juice, and extracts. Pour dry ingredients into large bowl of wet ingredients, using spatula to stir. Then fold in blueberries. Pour batter into prepared loaf pan – I like to make sure not all of the blueberries are sitting on the bottom of the pan so give the batter a gentle stir in the pan. Top the batter with sliced almonds if desired. 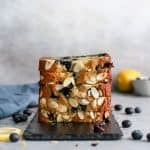 Bake lemon blueberry bread for 20 minutes uncovered, then add foil for the last 15-20 minutes of baking to prevent the top from browning too quickly. My bread took 43 minutes but check the middle for done-ness with toothpick after 35 just to be sure. I do not recommend substitutions here as grain-free baking can be tricky. See notes in blog post. Store bread in covered container at room temperature up to 2 days, or in fridge 4-5 days. This bread is very moist so just keep an eye on it! Hi Lea! I haven’t tried replacing the tapioca flour with wheat flour but it could work. I would recommend adding something rather than leaving out that 1/4 cup completely, so the wheat flour could be your best sub. You can also sub with cornstarch if you have that handy. Let me know if you try! This bread looks divine!! I currently have Arrowroot starch in my pantry. Do you think I can sub this out for the Tapioca flour? Also, any thoughts on subbing lemon essential oil for lemon extract? Thank you! I was wondering exact same questions! I do believe arrowroot can be subbed but I haven’t tried that myself. And as long as the essential oil is edible you should be good to go there as well! This bread sounds delicious! I love anything lemon flavored and love that it is a Paleo option. Is it possible to sub applesauce for eggs? Tried it without eggs (I’m allergic), and substituted for a flax egg instead… Taste is amazing but I agree. The bread fell a bit once I took it out to cool! Ahh yes the eggs do quite a bit to hold the bread together here but thank you for letting me know how the sub went! This looks delish! Can you use frozen blueberries? Hi Lisa! Yes you can use frozen, just make sure they’re not super wet before adding to the batter. Tossing them in a little bit of tapioca flour can help too! Couldn’t agree more – blueberries and lemon are meant to be together! And this looks amazing! I loved this recipe. I used Bob’s Red Mill AP GF flour in place of the tapioca (since it’s in the mix) and I subbed applesauce for oil and added about a quarter cup almond butter. I used flax eggs and maple instead of honey and it was really delicious. Can you use dates instead of honey? The recipie sounds delicious but I’d like to give this to my 7month old daughter and she’s not allowed honey until the age of one. You can probably sub with date paste and it should be alright. I would probably recommend a similar liquid sweetener if possible, but I do think date paste would work as well. Let me know what you try! What a great recipe! I made this today and the whole house smells great. It is very tasty, and a welcome treat for a snowy day. Thank you for sharing. 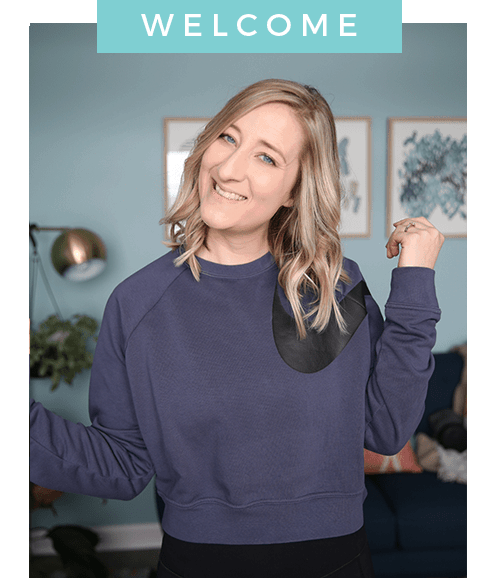 Hi Theresa – This recipe calls for almond flour, not wheat so just be mindful when subbing the millet. I am not sure what the substitution for that would be when subbing millet for almond flour. Ghee is just clarified butter – you can also use butter or oil. Hope that helps! Made it this week and it was absolutely incredible! Will definitely make this again. Hi Jasmine, I don’t calculate nutrition for a couple of reasons – but mainly because the information I provide is likely not that accurate and I don’t want someone putting too much emphasis on the calorie count. I will say this loaf is pretty nutrient dense being that it uses almond flour, so it’s lower carb but higher in fat. You can use a tool via myfitnesspal.com and plug the link into their website to get approximate information. This looks great. I had a question: my partner has an almond allergy so was wondering if you could suggest a substitute for the almond flour that he could eat? I always see these awesome looking recipes with almond flour but am never sure what to sub in since it’s so moist! Hi Caitlin, that is unfortunately a tough one! I haven’t been successful with many 1:1 subs when baking with almond flour. You may be able to sub something like a coconut flour with similar results, but you can’t use the same amount. My best guess would be to use 1/2 cup of coconut flour in place of the 2 cups almond flour. I haven’t tried that myself, but that is where I would start. Unless you’re pretty advanced in paleo baking, finding subs can be a challenge! Hi Ashley, can i sub the honey with Xylitol? so how much Xylitol in place of 1/4 cup honey? My cousin is diabetic so most sweeteners are not allowed, Natvia which is made with granulated stevia or Xylitol is ideal to use in desserts etc. Hi Wanda, while I haven’t tried that myself I am guessing just 2-3 TBS of xylitol would work here. You may need to add a few TBS of milk though to replace the liquid part of the recipe. Hope that helps! I was really trying to avoid buying Tapioca flour, but I have water in my mouth just staring at this pictures. Making this loaf this weekend and I CAN’TTT WAITTTT!!! I’ll report back on how delish it is. 2 tbsp melted coconut oil + 2 tbsp apple sauce instead of 1/4 cup oil (I think I’ll try all apple sauce next time). 1/4 maple syrup instead of honey. 1 tsp vanilla extract instead of almond extract. Used frozen blueberries (rinsed under water until water ran clear). Hi Julia, unfortunately there isn’t a good 1:1 sub that I know of for almond flour. Your best bet would be to find another recipe using a flour you can have in your diet. I have a lemon poppy seed donut recipe that you could add blueberries to and likely bake in a loaf pan, I just haven’t tested that myself. Can this recipe be used for muffins ? I haven’t tried that yet but I assume so! Bake at 350ºF and check after 15 minutes! Inserted toothpick with little to no crumbs (not wet batter) is when they’re done. Would love to hear how it goes if you try! I used muffin pan because I don’t have any bread pan. They came out fine, but I baked for about 18 mins. I also accidently this recipe tonight with Arrowroot instead of Topioca. To my suprise, the muffins are fine and yummy! Hi Claire! Thank you for your comment and review! I am so glad the muffins came out for you. And Arrowroot is typically an OK replacement for tapioca 🙂 Thanks again for your comment! One of the paleo recipes that is palatable to all. Thank you so much for sharing. I made exactly as indicated except for the lemon..I had lemon peel (dried) that seemed to work fine and then I used vanilla instead of lemon juice…will make sure I have a lemon the next time..I am sure it will be even better..if that is possible. I’ve made this recipe twice, so delicious! The first time I didn’t have lemon extract and my almond flour was not blanched! It was still delicious, but the bread had a heavier consistency. My second attempt was even tastier, a lighter, moister loaf with more evenly spread out blueberries, I added the last bit while the batter was in the pan. Thank you so much, my family who have no food restrictions, unlike me, loves it!